Writing Through Grief is about witnessing and allowing for the full range of feelings that come with loss. It’s hard to grieve fully and deeply when grieving is not honoured or supported, and when the people and culture around you feel so uncomfortable with your feelings and their own. How do we grieve when we’ve never seen anyone go through a healthy grieving process? How do we grieve when we can’t cry around our loved ones? How do we grieve when we don’t know how? Writing Through Grief is a discovery of the beauty that comes on the other side of grief. The sparkling moments of joy and connection, all of which are only possible because of the grieving that has been done – the crying of tears, the anger, the sadness, the acceptance of how unfair life can be. It is through honouring our grief that we come to understand and honour our joy better. Just like painting a self-portrait, writing about yourself is an opportunity to take charge of what your story is and who you are. 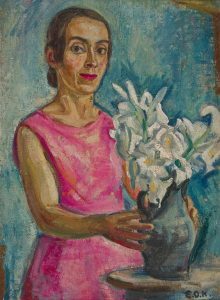 Avtoportret (Self-Portrait) by Elsa Oeltjen Kasimir, 1932. Oil on canvas. Maribor Art Gallery [Public domain], via Wikimedia Commons. In this series we’ll use a writing circle format with creative writing prompts to explore and move through your grief in a deep, kind and joyful way, in community.